Microsoft Visual Basic (VB) is the most popular programming language in the world, with millions of lines of code used in businesses and applications of all types and sizes. In this edition of the bestselling Wrox guide, Visual Basic expert Rod Stephens offers novice and experienced developers a comprehensive tutorial and reference to Visual Basic 2012. This latest edition introduces major changes to the Visual Studio development platform, including support for developing mobile applications that can take advantage of the Windows 8 operating system. 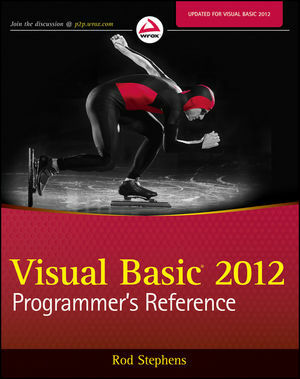 Visual Basic 2012 Programmer's Reference is the programmer's go-to reference for the 2012 edition of Visual Basic. Rod Stephens is a VB programming guru and the author of more than two dozen programming books, including Stephens' Visual Basic Programming 24-Hour Trainer. He also writes frequently for such magazines as Visual Basic Developer, Visual Basic Programmer's Journal, and Dr. Dobb's Journal. Rod's VB Helper website (vb-helper.com) provides thousands of pages of tips, tricks, and code examples for VB programmers.